At Fifth Crow Farm we grow over two acres of Certified Organic cut flowers. We pride ourselves in having a reputation for some of the freshest and most beautiful, unique bouquets around. Our production is mostly outdoor and field grown though we do have a couple in field high tunnels. We cultivate over forty varieties of annuals and perennials, focusing on the more unusual and pollinator friendly whenever possible. Our cut flowers are primarily available in the form of custom hand-tied mixed bouquets at our farmers’ markets as well as at the Birite Grocery Stores. We do some florist direct sales and also have wedding and event offerings (see below for information on how to get on our wholesale list). In the winter we offer hand crafted dried floral wreaths, made by our flower production team using exclusively flowers and grasses grown in our fields. 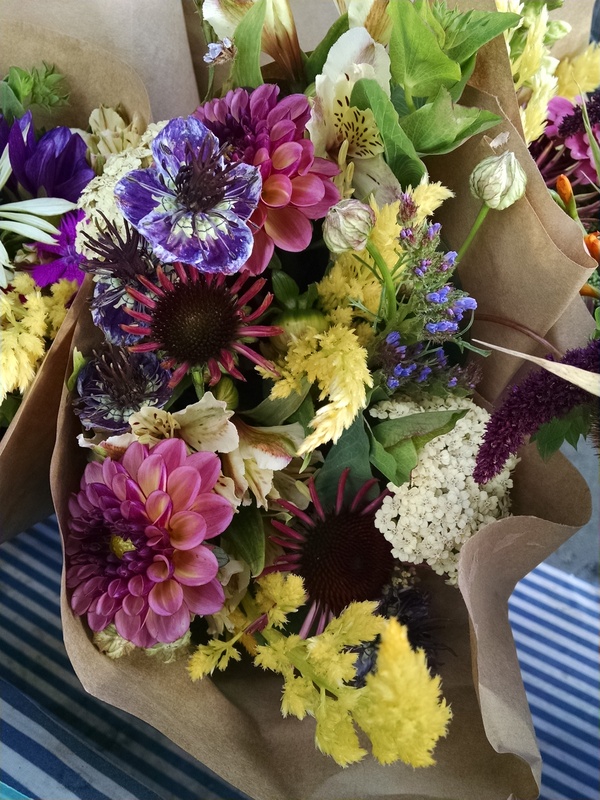 Many of our CSA members opt for a flower share, receiving a fresh mixed bouquet each week in addition to their box of produce. We are also proud to be a certified Bee Friendly farm. While many consumers are aware of the importance of buying organic produce for its quality and health benefits, most do not recognize how vital it is to buy local, organic cut flowers as well. Organic flowers are better not only for you as the consumer but also for the environment and for the people growing and handling the flowers. According to the USDA, 80% of cut flowers sold here in the United States are grown in other countries.1 Most of these flowers come from countries in South America like Colombia and Ecuador, but some come from as far away as Kenya and Thailand. In order for flowers to be imported, they must pass a rigorous inspection by the department of U.S. Customs and Border Protection to make sure they are free of harmful pests and potential plant diseases. In order to ensure that their flowers will be successfully imported, this leads cut flower growers around the world to heavy use of pesticides and highly toxic chemicals, some of which are banned in the U.S. and other countries. Imagine that someone just handed you a pristine bouquet of a dozen red roses. What is the first thing you would do? Very likely, you would hold them up to your nose and inhale. Not only would these imported flowers lack a strong fragrance since much of the scent has been bred out of them—you’d be subjecting yourself unwittingly to the chemicals used to grow them. By bringing such flowers into your home, you are also exposing your children and family to these toxic substances. The application of these pesticides contaminate the soil and the groundwater supply, affecting the health of humans and wildlife, and the chemicals that enter the atmosphere find their way to other parts of the world in the form of precipitation. These pesticides also negatively impact beneficial insects like bees and other pollinators that are essential for maintaining the global food supply. In addition, the international flower trade is notorious for labor practices that severely restrict worker’s rights and well being, and the workers who grow and handle the flowers are exposed daily to the harmful chemicals used by flower farms. Studies show that this exposure has a significant negative impact of the health of these workers and their families, causing everything from dermatitis, nausea, and headaches to neurological issues and reproductive health problems. If you want to learn more about these issues, you can read this article about the Colombian flower trade.